These handcrafted, botanical bitters will shake up your favorite cocktails. Maybe it's a Dark 'n' Stormy night. Or maybe your style is a bit more Old Fashioned. Whatever the case, these handcrafted bitters are sure to lift your spirits in the best possible way. It was Phaedra Achor's love of vintage cocktails that inspired her to create her own premium bitters using organic, locally harvested or wild roots, barks, herbs, and spices. This versatile sampler contains four remarkable flavors: cherry vanilla, orange, citrus basil, and cayenne ginger. Each one comes with a suggested cocktail recipe on the back, but they also offer any budding mixologist an opportunity to experiment. In addition to stirring things up at your home bar, these bitters also make a great complement to coffee, sparkling water, ice cream, and more. Handmade in Petaluma, California. Everything about Californian Phaedra Achor seems to harken back to the style of a bygone era. Instead of just grabbing a beer with friends, she developed a passion for mixing little-known, vintage cocktails. Instead of settling for supermarket varieties of bitters, she began to experiment with bottling her own. And of course, instead of using commercial flavorings, she turned to the natural botanicals and wild-harvested herbs that would have been enjoyed a hundred years ago. 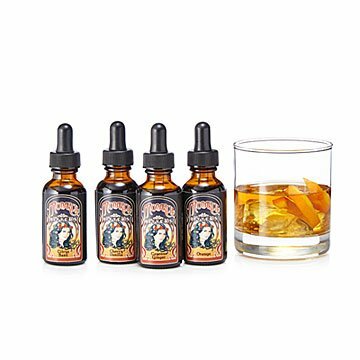 The resulting bitters combine those classic elements with a modern penchant for esoteric flavors, resulting in a taste that is truly timeless. In Gift Package: 4.8" H x 3.3" Dia. First, the packaging is gorgeous. The bitters come in a nice quality black round box with a red wax seal. Very classy! The bitters are delicous, each unique and distinctly different from the others. They make a fantastic addition cocktails and mocktails.